Scrooge: Before we delve deeper into this slot, its important for you to know that this slot isn’t exactly the Muppets Christmas Carol. But, this isnt actually a bad thing – this game is jam-packed with features that will entertain your for hours on end. For instance, it comes with 50 pay lines that give you a ton of chances to generate some excellent winning combinations. All the reels come with wilds, multipliers, and there are a seemingly unlimited amount of free spins that you can trigger on Christmas Day. Hitman: Love the gore in the original Hitman movie? Sorry to burst your bubble, but the effects are a bit more toned down in this game. Still, this game is far from boring. And with its 5 reels and 15 pay lines, it still packs a good punch. This game has everything you could want in a slot while still keeping things simple enough that even first-time slots players will be able to follow the action. One of its most notable features is its expanding wilds, which give you the chance to get some great winning combinations. It also features a free spins round, which as you can imagine, can help fatten your pockets quite a bit. 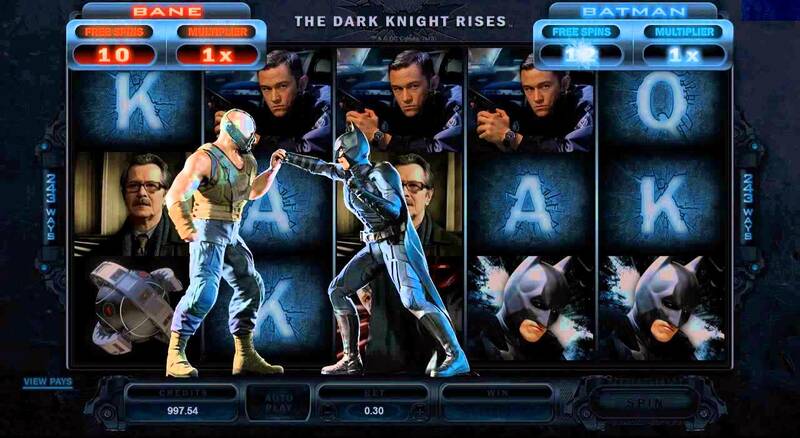 The Dark Knight: Want a slot that provides lots of ways to win and is as exciting as the movie its inspired by? You can’t go wrong with The Dark Knight. It offers 243 ways to win, 15 free spins with multipliers, stacked wilds, and so much more. The Dark Knight Rises: If the Dark Knight is too tame for you, its sequel (the Dark Knight Rises) will be sure to please. It features stacked wilds, a free spin accumulator, and much more. Hellboy: Developers have made amazing progress when it comes to slots. And, while we cant say exactly the same for this slot (it hasnt gotten its makeover quite yet) its still a fun way to pass the time. It comes with 20 pay lines and a couple of unique playing features (like the randomly triggered Super Mode) that you will be sure to love. Why? The Super Mode randomly doles out free spins – 10 to be exact. Another great feature is the Underworld bonus, which is triggered when you get ahold of at least 3 scattered symbols. And, while this is an easy picking game, making the wrong decision can end your mission. Tomb Raider: Are you a fan of Lara Croft? She may not be in the movie theaters anymore, but you can find the excitement and action-packed adventure this series is known for every time you play the Tomb Raider inspired slot. One of the best things about this game is its simplicity – even beginners will be able to get the hang of it in no time flat. It comes with a picking game, 15 pay lines, free spins, multipliers, and more. But, perhaps its most interesting feature is that it gives you the ability to change gameplay (like stakes and lines) to fit your specific preferences. With this feature, youre always sure to find a stake and level that fits both your style and budget.